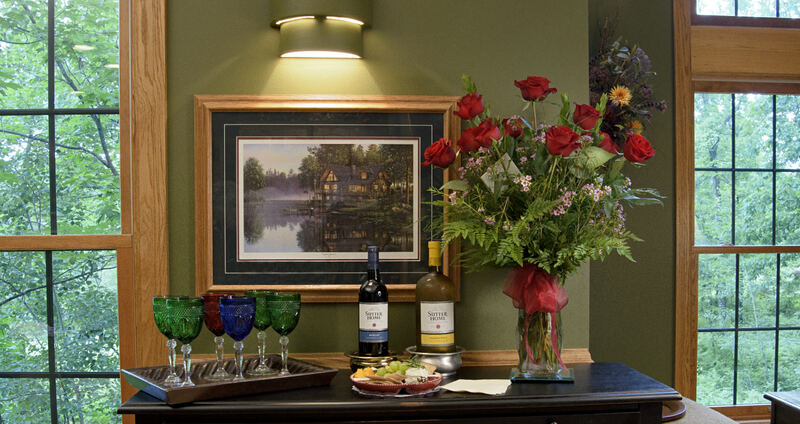 Make your Wedding Anniversary a memorable occasion by planning a romantic getaway at Woodland Trails Bed and Breakfast! A small Hand-Tied Bouquet of Flowers. A Woodland Trails Bed and Breakfast coffee mug. A $60 Gift Card that you can use for your Anniversary Dinner or to purchase a special gift for the two of you. The cost for this special is just $60 and can be ordered when you make your reservation either online or over the phone. 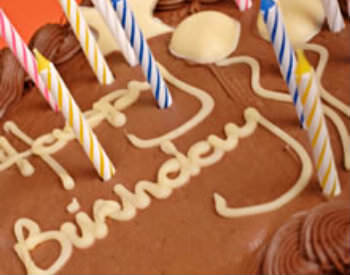 Celebrate your birthday at Woodland Trails Bed and Breakfast with a very special vacation package! 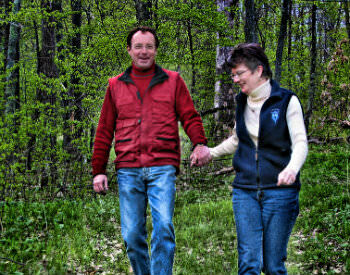 Besides spending time together during a relaxing birthday vacation, there are many things to do at Woodland Trails Bed and Breakfast inside the inn, out on Grace Lake Too (our private pond), on the land with miles of trails, and out and about in the Hinckley area. The Happy Birthday Special includes a Welcome Basket in your room plus a $30 Gift Card that can be used for dinner or a special gift for the birthday person. The cost is just $30 and can be ordered when you make your reservation. After a hectic time leading up to your wedding, a relaxing honeymoon at Woodland Trails Bed and Breakfast is a perfect way to start your lives together! A $60 Gift Card that you can use for a Honeymoon Dinner. CONGRATULATIONS AS YOU START YOUR LIVES TOGETHER! 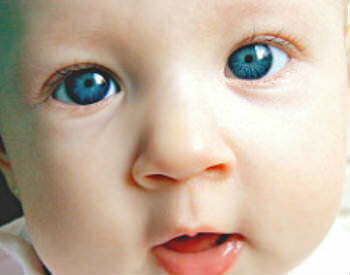 Expecting a little bundle of joy? Need some time for just the two of you? Take a break from the planning, organizing and deep breathing exercises to spend some time enjoying each other’s company at Woodland Trials Bed and Breakfast. 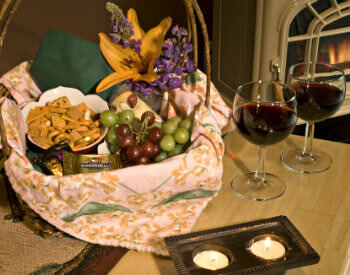 When you arrive, you will find a welcome basket in your room including fruit, goodies and Perrier sparkling water. The cost of this special is $60, which you can request when making your reservation either online or over the phone. For a special adventure during your warm-weather stay at Woodland Trails Bed and Breakfast, consider a picnic out on the land. We’ll prepare a basket for you with cheese and crackers, fruit, cookies, bottled water plus a half bottle of chilled Kendall-Jackson Chardonnay wine. 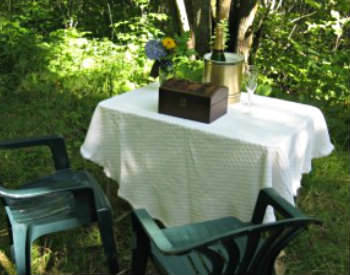 You can enjoy your picnic in the gazebo on Grace Lake Too or at a special private spot we have prepared out on the land. The cost of this special is just $30. You can order it when you make your reservations, either online or over the phone. In case of inclement weather, we will refund the cost. 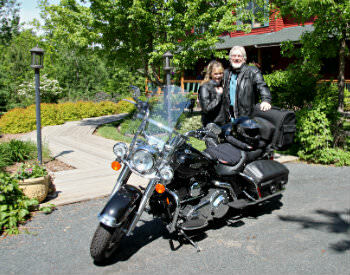 Woodland Trails Bed and Breakfast is a perfect destination for a Minnesota motorcycle travel adventure. 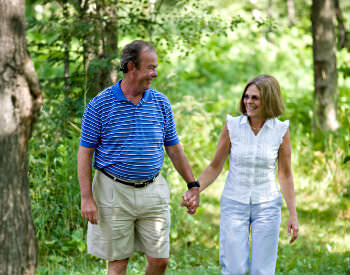 We’re located on a paved road less than two hours from the Twin Cities, St. Cloud or Eau Claire and just over an hour from Duluth. If you are coming from or through the Twin Cities, you might enjoy our Scenic Route. Once you’ve arrived, we’ll start your motorcycle vacation with “lodging” for your bike inside our garage. We’ll also supply you with towels for shining your bike. Just across the St. Croix River from Woodland Trails Bed and Breakfast is Burnett County, Wisconsin – Bikers’ Heaven — where town and county roads are all paved for your motorcycle getaway. We’ll be happy to suggest a route for a scenic tour. Engagement Special - For Single Men Only! At Woodland Trails Bed and Breakfast, the success rate for proposals of marriage made and accepted is 100%! GPS Proposal Adventure: Based on the sport of geochaching, we have private caches hidden on our land that can be found with one of our GPS units. Guests find it very satisfying when they locate a cache and discover what’s inside. For your proposal, we can put your engagement ring in a cache. As the GPS receiver leads the two of you to the spot, what a romantic and memorable find this will be for your future wife! The photo shows the most elaborate cache we have arranged with a young man which included flowers, champagne and a treasure chest containing the ring, all located at the end of a remote trail. Your cache can be something simple, such as the ring inside a box at the base of a tree, or something elaborate. Either way, we are happy to help! When you make your reservation online, use the “comments” section to let us know of your plans. We’ll be ready to help you decide how to pop the question! It is very gratifying when guests come back, some as many as a dozen times! For our past guests who are returning anytime within 13 months of their last visit, we say Welcome Back! with a discount of $25 per night.